The authors present experimental data in Figure1 of the published paper and claim that diffusion coefficients measured in space under isolation conditions (g-jitter suppressed)show a linear relationship with temperature. But according to the Final Report that Smith submitted to the Canadian Space Agency in 2000, temperatures could not be measured in space (see p.92). According to the Final Report (p.92), it was hoped that the oxide film on the tubes would provide specific information about the furnace temperature, the treatment time, and the degree of container insertion into the furnace. 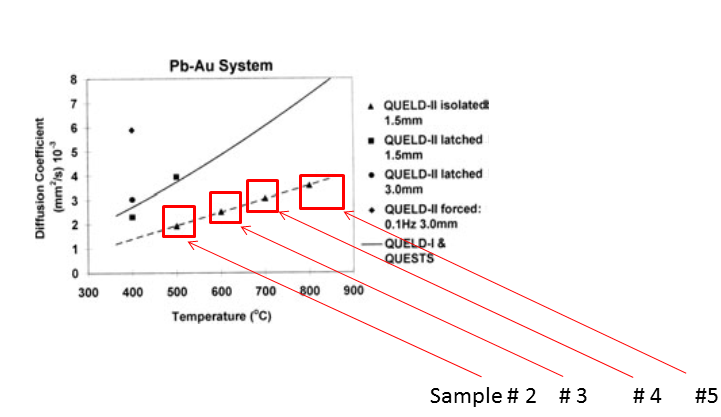 How was it possible to scientifically find these three parameters by looking at the color of an oxide film after samples were returned to earth? The subjective and private procedure that was used to determine the processing time and temperatures is not disclosed in the published paper. An accurate account of the research performed is not presented. The scientific community has been led to believe that temperatures given in the published paper are real temperatures and were scientifically measured in the MIR space station. But according to Smith, "the only method which remained was visual comparison" (p.97). 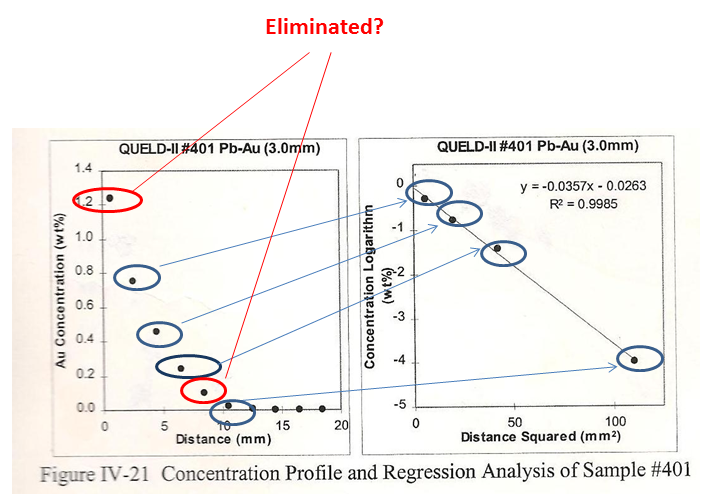 In the Final Report, Smith concludes on page 101 that the experimental results from lead-gold diffusion couples (sample # 1, 2, 3, and 4) should be of “particular concern” . But this serious concern is not disclosed in the published paper. 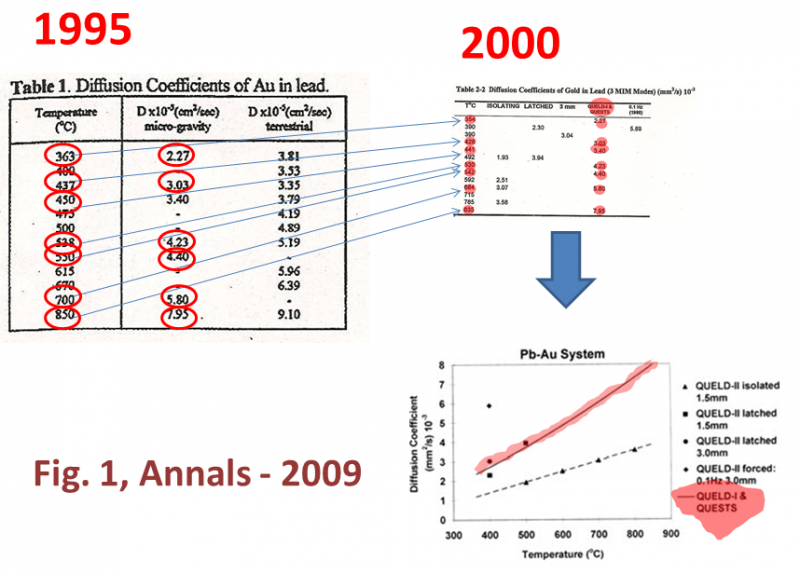 Despite the fact that temperatures and diffusion coefficients could not be scientifically determined and despite the fact that the author himself has expressed concerns about the validity of his own experimental results in the Final Report, the data presented in Fig.1 of the published paper show a remarkably perfect linear relationship for these samples! The results are too good to be true. Data points are made up to fall on a straight line. The conclusions in the paper are based on a set of data that are fabricated. The same fabricated data are published in more than 16 journal articles and conference papers. Interestingly, the title of one of these papers is "The Influence of Gravity on the Precise Measurement of Solute Diffusion Coefficients......" (Reginald W. Smith, Xiaohe Zhu, Mark C. Tunnicliffe, Timothy J. N. Smith, Lowell Misener, and Josee Adamson. 2002. Annals of the New York Academy of Sciences 974: 57–67). With the development of MIM, the CSA invited the PI to develop QUELD II, ……. Subsequently it operated on the MIR for more than 2 years and processed a total of 200 samples of various types, including long capillary diffusion samples. The information given in the published paper is misleading and incomplete. According to page 5 of the Final Report, many of the samples could not be processed under desired conditions due to the ﻿failure of the QUELD II furnace (more on this coming soon.....). An accurate account of the research undertaken has not been presented. “The authors declare no conflicts of interest”. This statement needs to be corrected for the readers. Conflict of interest is the main reason why serious experimental failures have not been disclosed in the Annals 2009 or in the earlier papers. 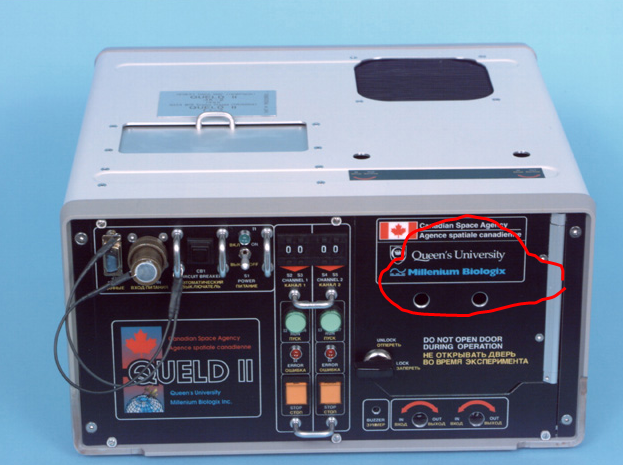 The QUELD II furnace that was used for the space experiments( shown below) was made in collaboration with ﻿Millenium Biologix, a company with family link. The same company also designed ATEN (more on this soon). Conflicting data have been eliminated in order to claim a linear relationship between D and T.
Omitted data are shown in Acta Astronautica 64, 256-263 (2009). When one includes the omitted data in the analysis, a non-linear relationship will emerge that undermines the main conclusions in the published paper. Furthermore, the flight documents recently obtained from the Canadian Space Agency show that sample # 61,62,63,64, and 65 were all processed under "Latched" conditions by the astronauts - not "isolated" conditions as claimed by the authors. This further undermines the validity of the conclusions in the paper. The results are misrepresented. The authors had no data to demonstrate a linear relationship between D and T under isolation conditions. In the published paper, the authors refer to the STS flights in 1992 (Fig.1, below) and claim that "these early experiments, conducted with the in situ g-jitter of the shuttle, showed the near-parabolic variation of D with T reported by others." This statement is not correct. The authors have altered the original temperature values that Smith published in 1995 in order to claim a parabolic relationship. The original temperature values reported in 1995 were shown by Smith et al to fit an exponential relationship, a fact that was "somewhat surprising" to Smith in 1995 because the results were not in agreement with the findings of other researchers (see page 3 of the paper published in 1995). And now the results do not appear to be surprising. Note: The altered data were presented on page 8 of the Final Report that was submitted to the Canadian space Agency in 2000. The altered data were then used in numerous journal articles, including Annals of New York Academy of Sciences. Concentration profiles are given in the Josee Robert's Master Thesis . Problems are discussed in Acta Astronautica 64, 256-263 (2009). An example is given below for sample # 401. Diffusion coefficient determined from the slope of the graph on the right is used in Fig. 1 of the published paper - Annals 2009 (See Fig. 1, D= 5.89 ( Forced Mode)). There are other serious problems with this published paper. Click ﻿here﻿.